Map of Abyssinia and Surrounding Countries. 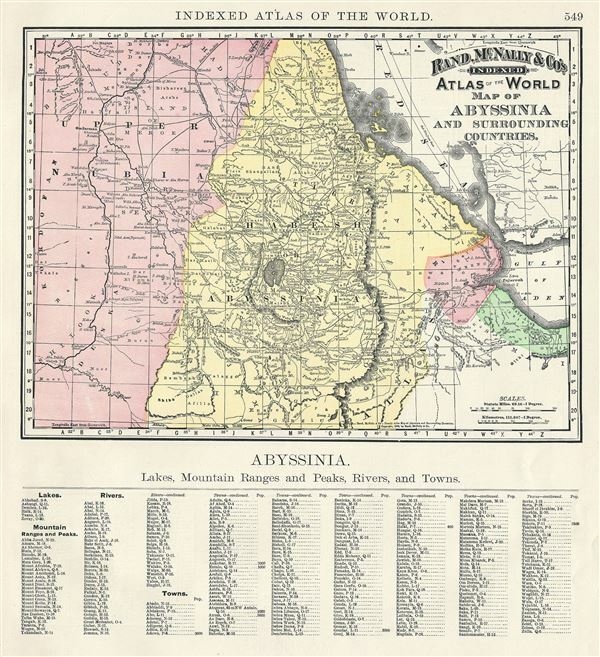 This is a beautiful example of Rand McNally and Company's 1892 map of Abyssinia (Ethiopia) and surrounding countries. It covers from El Mekheir (Berber) to Zooay Lake. This map was made during the last year of the Great Ethiopian Famine, which killed around a third of its population and lasted from 1888 to 1892. This map of Abyssinia and surround countries, printed on half the page unlike most other maps in this atlas, contains a list of divisions, lakes, mountains, rivers and towns in the lower half of the page, on the left of the printed map. Color coded according to regions, the map notes several towns, cities, rivers, mountains, and various other topographical details with relief shown by hachure. This map was issued as plate no. 549 in the 1893 issue of Rand McNally and Company's Indexed Atlas of the World - possibly the finest atlas Rand McNally ever issued. Very good. Text on verso and at bottom of page, left of map.